Given that The Flash‘s 100th episode was called “What’s Past is Prologue” and included a trip through time, it’s surprising that the show didn’t spend all that much time paying homage to its past. 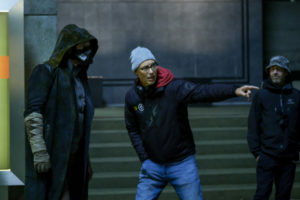 The very first scene, for example, was Sherloque (Tom Cavanagh) and Ralph (Hartley Sawyer) doing recon on Cicada (Chris Klein) – three characters who haven’t been around for more than a year in an episode that didn’t include even canned footage of either Joe or Wally. Perhaps an even more glaring issue was that Iris (Candice Patton) did not have any major moments outside of a sweet extra scene in flashback, despite being Barry’s (Grant Gustin) lightning rod and a reporter in her own right who could have uncovered more truths about the villain. We love one power couple. That’s not to say that it was a bad episode by any stretch of the imagination, or that it didn’t contain some excellent callbacks, merely that it could have told the same story with the core cast from the first four seasons instead of spreading itself thin incorporating the newer ones. But the events of “What’s Past is Prologue” wouldn’t have been possible without Nora (Jessica Parker Kennedy), so not every newcomer is unwelcome. It was her idea – though how much of it was hers and not planted by her surprising mentor is debatable – to go on a scavenger hunt through her father’s past to obtain the items required to make a weapon more powerful than Cicada’s power-dampening dagger power in the first place. And while Barry was once again reluctant to bring his daughter along and endanger both her and the timeline, Iris worked her magic and got him to comply with her wishes the way she always does. Once father and daughter were on their journey through the past, The Flash managed to create a tense and suspenseful series of events that left the audience wondering if Barry would make it back to the present with the timeline intact. Perhaps the most successful visit from a narrative perspective was the return of Zoom, which ended in a literal chase and the reappearance of the time wraiths. 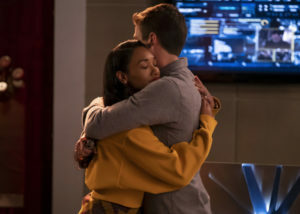 It was a powerful reminder of the show’s genuinely terrifying villains in the early seasons, and more importantly it provided viewers with a glimpse at a never before scene Westallen moment that underscored how much Barry leans on Iris. Nora needed to see her mother comforting her father to put their relationship into perspective, but also to offset all the terrible things she learned over the course of the evening. Not only did Nora never learn that Savitar was actually another version of Barry Allen, she didn’t even know that Eobard Thawne killed her grandmother. This had far-reaching consequences that her parents were still not aware of, but in “What’s Past is Prologue” the revelation was used as a bonding experience for her and her dad. Much like Iris tried to protect her in the future, Barry was hoping to shield her from several ugly truths in the present – but learning them only made the two grow closer. There were more goodies in store for fans than simply nostalgia, though, and one of the biggest ones was Eobard Thawne himself hinting at the Tornado Twins. Upon meeting Nora, he called her Dawn and then proceeded to tell Barry, “At least you still have one.” If that’s not a foreboding statement on timeline shenanigans, nothing is. Even a good director can’t save Cicada. Speaking of Eobard, his return meant The Flash‘s 100th episode doubled as a tour de force for Tom Cavanagh. He not only directed the episode quite admirably, presenting intimate moments that conveyed emotion through body language rather than dialogue, he also appeared as the superior Wellses in various instances. In fact, one of the best moments of the night was a bittersweet conversation between Eobard and Cisco (Carlos Valdes) on the night of the particle accelerator that reminded us of Thawne’s more human side. Unfortunately, his passionate performance as both Eobard and Harry just highlighted what a misfire Sherloque has been thus far. Especially when he’s the one uncovering Nora’s speedforce journal and figuring out the timeline is malleable instead of, say, Iris. Unless he is secretly Thawne as well, which is possible due to the repetition of “clever girl,” there’s no reason for his attempt at a French accent to take up so much screen time. Cicada was nearly stopped by the pieces that Barry and Nora gathered in the past, but the team didn’t count on the dagger being more like a boomerang that can come back even from space. On the flip side, Cicada also didn’t count on Caitlin (Danielle Panabaker) not-really-a-metahuman DNA which rendered her immune to his power dampener. He wasn’t dispatched entirely but he was deterred. While I think it was a good idea to establish how Killer Frost is different from other metas and thus utilize her in the current story arc, it also undercut Cicada as a Big Bad to have him run off the moment he gets ice thrown at him. If “What’s Past is Prologue” proved anything, it’s that The Flash needs to up its villain game once again. The episode ended with a rather huge Nora revelation that’s sure to upend the cozy West-Allen home: she’d been working with Eobard in the future this entire time and sending him reports of her progress. We’ll have to wait to see why and how, but it will definitely keep people talking through the crossover and until the show returns from hiatus. The Flash airs Tuesday nights at 8/7c on the CW.